The churches come thick and fast in this area to the south of Norwich. 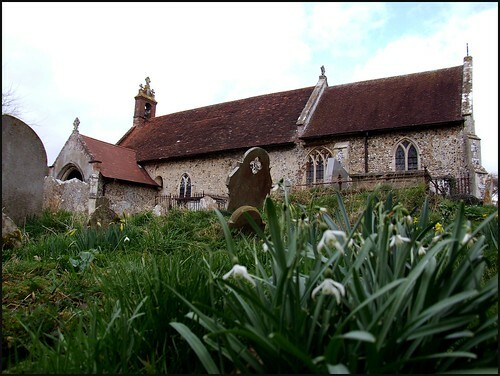 The parishes are tiny, the churches small and unlikely to bother compilers of lists of England's Thousand Best Churches and nonsense like that. John Betjeman once observed that this part of Norfolk has the greatest concentration of medieval buildings of anywhere north of the Alps, and that is probably about right. Flordon is too close to Norwich not to feel suburban, and at first I was put off by the bungalows and lap fencing which line the path up to the church. But as you step out into the graveyard, ignoring the tiresome, noisy attack dog in the adjacent garden (whatever possesses people?) you find yourself in a beautiful, ancient space, a gently rising summit that must have been a significant place in pre-Christian times. Here, in early March, there were still plenty of snowdrops in flower, and the low sun lit up the elegant, slightly ramshackle length of St Michael. This was a round-towered church once, like most around here, but the Victorians replaced the fallen tower with a red brick wall and a bellcote. The porch is handsome, and obviously popular with the local 'yoof', because a sign on the door said Dear People who use this porch, we know that there is nowhere in the village where you can meet and we are happy for you to be here. But please could you help us to look after this porch. It has been cared for by the people of the village for 700 years and it is our turn now. We hope that you will help us. There you are, I thought, the hand of charity, an act of living witness and a history lesson, all in one. And St Michael is a perfect example of what a village church should be. You step inside to a feeling of rural continuity, a sympathetic Victorian restoration overlaying the touchstones of the more distant past, the war memorials a reminder of more recent pain and grief. There's an image of St Peter in the east window, possibly 18th century, and some other bits with it which must all have been collected from a continental monastery or church by an antiquarian. One curiosity is the rather perfunctory early 20th century rood. All that survives is the crucifix in the middle; the figures of the Blessed Virgin and St John which Mortlock saw here and commented upon in the 1980s, are now gone. You can still see their fixings. Probably, they were stolen, but it did occur to me to wonder if they had actually been removed by the parish. The temper of churches around here is very low, and protestant sentiment might have led to the banishment of such idolatrous figures of Saints. In which case, this would have been one of the very last examples of puritan iconoclasm in all East Anglia. We came here on a Saturday, and so we found the church open. If we had come on a weekday, we would have needed to find a key, but in this undistinguished village, the relatively unimportant church of St Michael is exactly the kind of church which should always be open. This would ensure that it had a real significance beyond its role as a venue for the Sunday club. It wouldn't just be the notice on the door which was a standing beacon of charity, witness and history.